George Smith wants to lay down some roots after admitting his frustration at being a ‘yo-yo’ footballer. The 22-year-old has been on the books of eight clubs in his career. 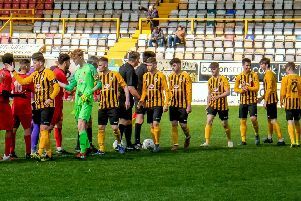 And although his ambition remains to return to the Football League, the loanee refuses to rule out extending his stay at Boston United beyond the end of the season in a bid to play regular matches. “I could have come here with eight games to go and think it’s just games, but I want to do the best I can,” said Smith, whose Chesterfield contract comes to an end this summer. “I’m still young. You could say I’ve been a little bit of a yo-yo, playing games in the Football League, in League One where I started with Barnsley, my home town club. Smith felt a loan move at Dover didn’t work out as he had wished earlier this campaign. He has also had spells at Crawley and Bradford Park Avenue. Although new to Boston, Smith settled in swiftly thanks to a few familiar faces. “I know Jake Wright from playing at Gateshead with him. I played at Barnsley with Brad Abbott and against Middo (Ben Middleton) and George Willis. “I know a lot of the lads and to, be fair, I’m that kind of character who, when I walk into a dressing room, even if I don’t know anybody, I’ll soon know everybody.